ET costs awards: what’s been going on? Rooting around in the latest set of quarterly ET statistics in the hope of finding something of interest – other than the emergent upward trend in median ET awards highlighted in my previous post – I was somewhat taken aback by Table E12 of the annual ET tables, on costs awards. 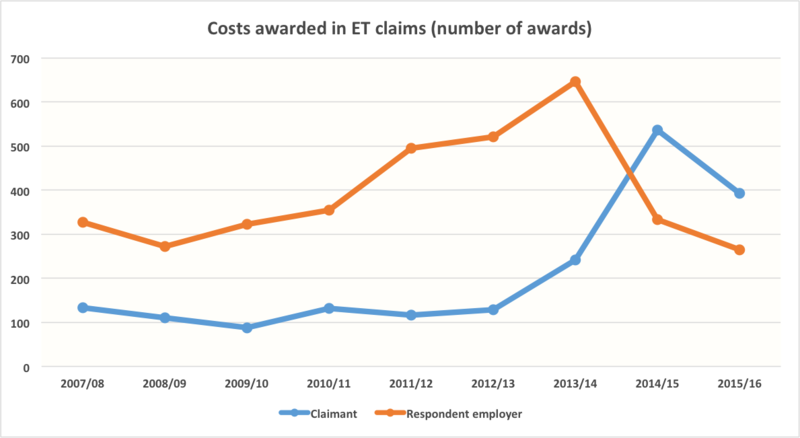 For, as the following chart shows, in the past two years the long-standing imbalance between the number of costs awards made to respondent employers (the orange line), and the number made to claimants (the blue line), has reversed. In each of the four years 2007/08 to 2010/11, there were about three times as many awards to respondent employers as there were to claimants, and by 2012/13 that ratio had risen to 4:1. But since 2013/14 the number of awards to respondent employers has plummeted, while the number of awards to claimants has risen sharply. And I am at a complete loss as to why that has happened. Can anyone out there explain what’s been going on? Am I just being even dumber than normal? I imagine the parallel fall in 2015/16 reflects the overall reduction in the ET system’s workload, due to ET fees and Acas early conciliation. But why the (pretty dramatic) switch-around? Update (23 September): So, barrister Jamie Anderson was first (on Twitter, last night) to suggest what looks to me to be the explanation, closely followed by Sophie Park (see comments, below): the data for costs awards to claimants from 2013/14 onwards includes orders made under Regulation 76(4) of the 2013 Regulations in respect of the repayment of fees, as well as standard costs awards made under Regulation 76(1). Which is a bit silly, really, and maybe someone could suggest, at the next ET User Group meeting, that such orders/awards be recorded separately from standard costs awards. This entry was posted in Justice and tagged Employment tribunals, ET costs awards. Bookmark the permalink. 2 Responses to ET costs awards: what’s been going on? If I had no other information I might argue that fees had deterred the vexatious or hopeless claims that previously attracted costs awards so that the claims that were left were the stronger ones. But how would we then square that with the fact that success rates have not improved over the same timescale? I suppose we are dealing with a very small number of cases in any event, so you can deter, say, 300 vexatious claimants who would have had a costs order, but not alter the overall percentage of claims that win/lose? The increase could be explained by cost awards to reimburse successful claimants for the tribunal fees paid under rule 76(4) perhaps?